Living in a continent as dry as Australia, it wouldn't be a surprise if people have a major desire to cool off as often as they possibly can in a swimming pool or beach. Extremely hot weather can be uncomfortable and distracting — not to mention harmful to health, if you're exposed to it long enough or frequently enough — and a quick dip can easily help a person feel more refreshed and rejuvenated. Of course, not everyone will have the means to drive out to one of the many splendid beaches Down Under on a whim, or even to a public pool — or, even if they did, many will likely prefer to cool off somewhere that is easily accessible, safe, and private. Therefore, many who want to be able to go for a swim in a safe environment, whenever they like, choose to invest in having a swimming pool installed in their own home. 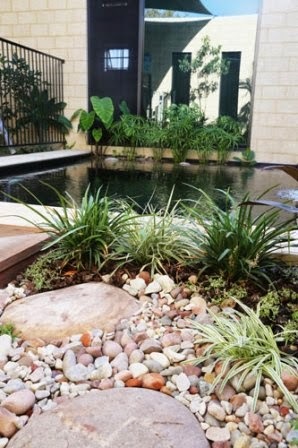 And because in Australia water is a precious resource, it's fortunate that there are companies you can contact that maintain the principles of natural pools so that homeowners can have a sustainable solution to their need or desire for their own home pool. The traditional swimming pool, as all would know, is a space carved out of the ground, cemented and tiled over, built with a filtration system, and filled with water that needs to be regularly treated with chlorine to kill bacteria and prevent the buildup of other unsavoury organisms. Anyone who has ever gotten into a typical pool will know the bleachy smell of the water, the dryness in their skin and the mild to severe irritation to the eyes and nose that are commonly associated with swimming in chlorinated water. A natural pool, on the other hand, makes use of specific types of plants and gravel that serve as its filtration system. These natural features filter out nutrients that would result in the growth of algae. It also uses a black liner that harnesses solar gain so that the water can be warmed without using electricity. A natural pool would be like a private little oasis within your own property. Imagine taking a dip in a pool with crystal clear water, surrounded by lush foliage and without a hint of chemicals whatsoever — it’s possible to have a sustainable (and breathtakingly beautiful) paradise in the midst of the extreme Australian environment. Kenneth Lawrence is a passionate "handyman". His craft involves DIY concepts and he loves to share guidelines and tips about stuff on home improvement. He writes and reads about almost anything that can help him hone his skills and increase his knowledge about DIY concepts. He occasionally writes for http://watermevertical.com/principles-of-natural-pools.